Shortly following the death of Joseph Smith in 1844, and into 1845, Lucy Mack Smith dictated her recollections and family story to Nauvoo schoolteacher Martha Jane Coray. Coray worked with her husband to compile these books of notes and other sources into a manuscript, which was then copied. One copy was given to Brigham Young, and the other stayed with Lucy Smith in Nauvoo. Eventually, Orson Pratt obtained Lucy’s copy and published it in 1853, to great controversy. In 1865, Young ordered the church members to have their copies destroyed. There was no “corrected” version until the church published a 1901 serialization and 1902 book, which were done under the direction of Joseph F. Smith, Lucy’s grandson. 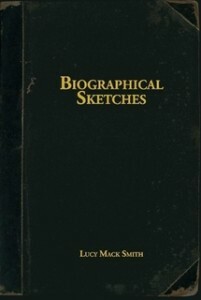 Later historians theorized that Young opposed the book because of his own conflicts with its publisher, Orson Pratt, as well as the book’s favorable references to William Smith. This reprint edition is of the 1853 Liverpool Edition published by Orson Pratt.